Caribbean GeoTextiles can supply and install GeoTextiles in the Caribbean and select countries in Central America. GeoTextiles are woven, high strength fabrics made specifically to provide reinforcement Hurricane Storm Protection soils. Applications include dikes and sludge caps where the superior attributes perform well for use in the Caribbean such as Trinidad and Tobago, Aruba, Dominican Republic, Bahamas, Exumas, Bermuda, Martinique, Virgin Islands, Cayman Islands and more. GeoTextile products line utilize strong seams give them the ability to remain exposed for longer periods of time than conventional non woven fabrics. Our high-strength woven polypropylene geotextiles (HSWG) provide superior bi-directional tensile strengths and are woven in a rip-resistant weave pattern. This innovative method minimizes damage due to vandalism or mechanical damage. 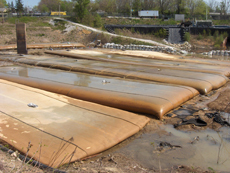 Our GeoTextile fabrics are manufactured with superior reinforced selvages to create higher sewn seam performances, in addition Hurricane Storm Protection to other innovations unique to the turbidity industry. To assist the contractor, colored marker yarns are placed parallel to the fabric edge to serving as a reference mark for overlapping adjacent panels. Our GeoTextile fabrics are manufactured in a aesthetically pleasing sand color to help them blend in with the environment while offering the highest UV protection in the industry. Usage is growing rapidly in the Hurricane Storm Protection in the Caribbean such as Bahamas, Exumas, Trinidad and Tobago, Virgin Islands, St. Kitts, Cayman Islands, Jamaica, as well as Central America such as Belize, Costa Rica, Nicaragua and Honduras. Contact us today to learn more.